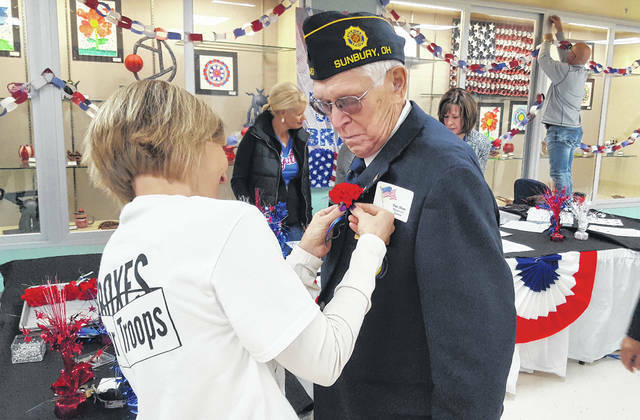 Joanne Neely, gifted math and science coordinator at Olentangy Hyatts Middle School, pins a corsage on Dan Shaw, a local veteran honored during the school’s annual “Living History Day” event on Friday. When it comes to teaching students about American history, teachers across the country have a number of resources at their disposal, mainly written words and photographs. Olentangy Hyatts Middle School history/technology teacher Nancy Poliseno, however, prefers her students get their history lessons from those who have lived it, which is why she coordinates the annual Living History Day, a veterans recognition event that took place Friday at OHMS. During the event, over 100 veterans and active military personnel were treated to breakfast, lunch, and an honor assembly held in the gymnasium. Following the assembly, over 70 of the honorees visited classrooms to share their stories with the students. Prior to the classroom visits, Principal Derrick Gilliam encouraged students to “take in” everything the veterans had to offer. 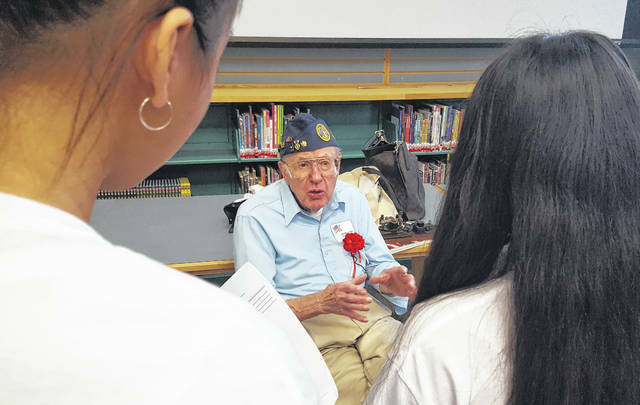 Poliseno, who has organized the event at various schools throughout the district for a number of years, said as the daughter of a World War II veteran, she learned quickly how “very precious” the American way of live is, and she is hopeful that is something students take away from events like Living History Day. Several classes on Friday morning had the opportunity to hear from Army veteran John Bergmann, 97, one of less than 600,000 American WWII veterans alive today. The Upper Arlington resident, who majored in accounting at the University of Pittsburgh, said he was gearing up for a career as an accountant when Uncle Sam came calling in search of mathematicians or as he calls it “number nerds” for a secretive unit. The unit he agreed to join was so secretive, Bergmann had to use a cover story for everything, so he told everyone he was doing payroll work for the Army, and when he lost his right eye from an explosive device while on a secret mission in Burma, that was the result of a rifle mishap while training. Forty years after the war, Bergmann told the students, he was finally able to reveal to his family and friends the truth — he spent his time in the Army cracking the enemies’ encoded messages as a codebreaker. While Bergmann said he hoped his stories helped students realize freedom doesn’t come free and wars are “not all glamour,” but instead “blood and guts,” he wanted to let them know there is something they can do right now to make a difference in the life of an active military member. “The most important thing for people to do today is to write to your families, brothers, uncle, or anybody that is in the service,” Bergmann said. “Write them a postcard or a letter telling them about school and what you are doing. “I’ve seen grown men at mail call get a card or a letter and sneak off to behind a tree or behind a building and sit there for an hour reading and rereading a one-page letter — a message from home,” he added.